Mr. A B Lalith A De Silva is a renowned journalist, writer, entrepreneur, political commentator and successful songwriter all bundled into one. He is a journalist by profession and holds a Diploma in Journalism from the University of Sri Jayawardanapura. He is the Chairman of Asian International Hotel School, and media director to the current President Hon. Maithripala Sirisena, Chairman of Asian Vocational Educational Centre, Organizer of the S.L.F.P for the Colombo District and Former Chairman to the Merchant Credit Of Sri Lanka Limited. He was born to a family of four children in Colombo, his father was a teacher, trade unionist leader, and one of the first editors of the Dinamina Sinhala daily published by ANCL, while his mother was a homemaker. He has been educated at 16 schools including Ananda and Nalanda Colleges. Asia International Hotel School started in 1984 as a Vocational Training Centre. After some time they started hotel management courses targeting unemployed youth. At present Asian International Hotel School takes about 3000 students per year and the students get on-the-job training at five-star hotels. The hotel school is established in a four-storied building, equipped with all the modern equipment to train the students to meet the needs of the industry. Mr. A B Lalith A de Silva started writing songs as a hobby and has written about 20 songs to date most of which are sung by popular artists. 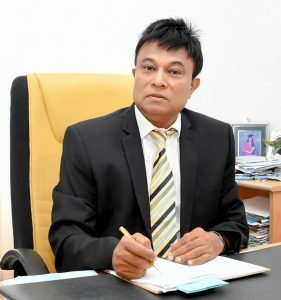 On an earlier occasion, he had contested the Provincial Councils in Colombo. He has written a book targeting the youth of the country while he also contributes to some of the country’s newspapers. Among his future plans are moving into active politics and improving the values of society through his writing. ආසියා ලංකා හෝටල් ජාත්‍යන්තර පාසල වෙත ඔබ සාදරයෙන් පිළිගනිමු. පසුගිය දශක දෙකක කාලයේදී මේ රටේ තරුණ තරුණියන් දහස් ගණනක් සංග්‍රහශීලී සංචාරක සේවයේ රැකියාවන්හී නිරත කිරීමට අපට හැකියාව ලැබුනි. මෙරට මෙන්ම පිටරටවලද, ගාම්භීර හෝටල් රැකියාවල ඔවුහු යෙදී සිටිති. මිලියන 40ක වියදමින් නුගේගොඩ අප මූලස්ථානයේ ඉදි වූ සම්පූර්ණ හෝටල් පාසල් සංකීර්ණය නිම වීමත් සමඟ ජාත්‍යන්තරප්‍රමිතියෙන් යුත් ගෞරවනීය පාඨමාලා සඳහා තව තවත් අපගේ තරුණ තරුණියන් බඳවා ගැනීමට හා ඔවුනට අවශ්‍ය අංග සම්පූර්ණ ප්‍රායෝගික පුහුණුව අපටම ලබාදීමේ හැකියාවක් උදාවී ඇත. ශ්‍රී ලංකාවේ තරුණ පරපුර අප කෙරෙහි තැබූ විශ්වාසය අද යෝධ අධ්‍යාපන ව්‍යාපෘතියක ශක්තිය බවට පත්වී ඇත. සභාපති – ආසියා – ලංකා ජාත්‍යන්තර අධ්‍යාපන පදනම. The Asia International Hotel School in Nugeoda is the first private hotel school in Sri Lanka. It has borne services in the multifaceted field of hotel education for the last 20 years. The Asia International Hotel School has trained thousands of young Sri Lankans, and most of these young people are successfully employed nationally and abroad. The Asia International Hotel School certificates are professionally recognized by employers in the Middle East and Western countries. Our school has linked up with prestigious brands such as Taj Samudra, Colombo Hilton, Trans Asia, Holiday Inn, Mount Lavinia to provide on-the-job training and experience.